I guess you could say my love of handkerchiefs is Wabi-sabi love. Wabi-sabi is the Japanese aesthetic of finding beauty in things that are imperfect, impermanent or incomplete. The two separate words have related but different meanings. “Wabi” represents the kind of beauty found in imperfection, for example, the asymmetry in a ceramic bowl which reflects the touch of a human artist, as opposed to the “perfection” of a bowl made by machine. “Sabi” is the beauty that develops with age, such as the patina on bronze or a beautiful piece of furniture.Together, the words represent finding beauty in something that may at first appear aged or imperfect, but the imperfection itself belies something beautiful. To me, this wedding handkerchief is a perfect example ofWabi-sabi love. 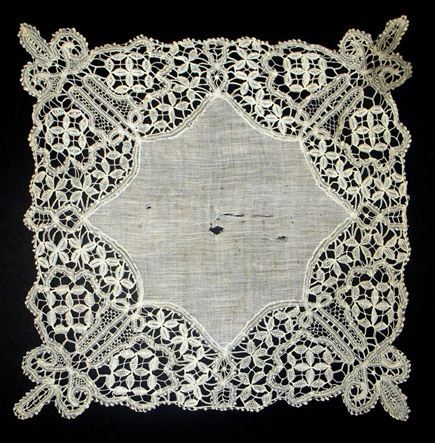 Obviously passed down through the generations, its worn, torn linen center is as fragile as tissue paper and shreds just as swiftly, but the magnificent lace border remains strong and firm. Wise is the bride who understands it will be easy to replace the worn center, but impossible to replicate the painstaking handwork from generations past. (Just as it’s easier to mend an argument than to replace a good husband.) Most might discard this beauty I’m afraid, yet you can tell from looking at it that it has made the trip down the aisle with more than one generation of bride, and holds many tears of joy. What a dear treasure.